Busy times at Erskine! The past week has been one activity after another, from a ghost walk through Due West to the traditional Big Man on Campus competition, tests to rehearsals, concerts to Homecoming activities. Last Friday was the Fall Choraleers Concert, the first under our new director, Mark Nabholz, and what an evening it was! We had a great turn out of family, friends, alumni, and students in the audience, and all the music sounded wonderful. The in addition to the Choraleers, our main choral ensemble, the Chamber Singers, a small mixed ensemble, and the Fleetones, our men’s ensemble, sang a few selections. One of the great things about being in the music department at Erskine is being able to use our talents to create beautiful music. We make a point in Choraleers to sing for God, and we always pray that we will be able to touch our audience with our music. On Saturday, after a day of homecoming activities, in the evening we enjoyed a concert of a different sort – Fall Fest. On the steps of Bowie Arts Center, in the middle of the mall in the center of campus, students, alumni, and other members of the Erskine community enjoyed the music of bands Prettier than Matt and Sequoyah Prep School. There was also hot chocolate and cider, as well as pumpkin carving for everyone to enjoy while listening to the music. One of the highlights of the evening for me was seeing a former Erskine student, Jessica Skinner, singing and playing in the opening band, Prettier than Matt. I only knew her for one year while in school, as she was a senior my freshman year, but it was fun to see what a former music major has been doing in the few years after graduation, and I even got to talk to her for a little while. There is hardly ever a shortage of excitement here! Stay tuned for this week’s big event for me – the opening week of our fall play, Shakespeare’s The Tempest. Pumpkins carved at Fall Fest - Happy Halloween! ve some late night goodies cooked by the Athenians! However, being in a society does not make your friendships exclusive, as I hang out with a wide variety of friends. Of course, one of the best things to enjoy in college is to go out to dinner and order your own food the way you want it! Therefore, last night a bunch of us went out to celebrate one of my best friend’s birthdays at Chili’s. Good times and laughter are always a great way to end a long school week. While it may seem like something simple, spending time with friends in simple settings is a huge part of college life. You don’t always have to have a campus wide activity to enjoy the evening, and in Due West, this is often the case. Learning to make your own fun is part of the college experience. While Erskine is a very challenging academic campus, I have also found it to be challenging spiritually as well. Surrounding by students in this Christ-centered environment, I am always learning new things about myself and my faith. Part of this comes from the various interactions with fellow students on campus, but also from the several worship opportunities we have. Some of the opportunities for fellowship include Fellowship of Christian Athletes, Baptist Collegiate Ministries, Reformed United Fellowship (The Barn), as well as chapel services offered by both the College and the Seminary. While I have attended many of the previously mentioned organizations, this past weekend I thoroughly enjoyed my experience at the Barn. 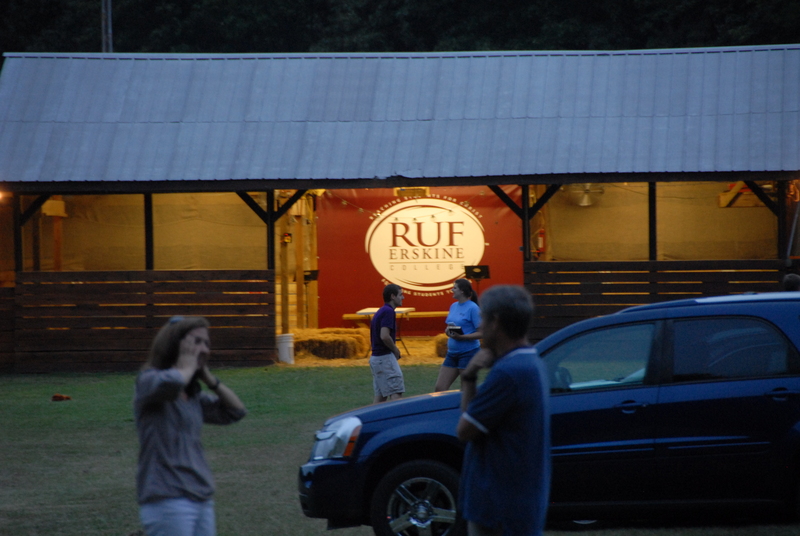 This year, the Barn has officially become RUF. This off campus barn is located about 4 miles out of town and is attended by several Erskine students on Sunday evenings. However, this past weekend, the worship was opened to the community as a special barbecue dinner was provided as well as a hymn sing led by three vocalists of Indelible Grace. This time of worship offers students a change to enjoy the cooling temperatures and the sound of nature as we sing and praise God for all of our wonderful blessings. I left feeling energized for the week and calmed from the stresses that school often bring. Something about sitting on hay bales in the cool of fall brings me closer to my own faith and helps me reflect on the true meaning of life. The inside of the cathedral near my apartment…breathtaking. One thing I love about living in another country is that every day is full of adventure. Not only is it fascinating to travel to new and exotic places, but every bus ride, every afternoon stroll, and every interaction is also an opportunity to learn new and fascinating things about Spanish language and culture. For instance, simply by riding the bus to the university—and public transportation is an adventure in and of itself, as my friend Lisa will tell you—I’ve had the opportunity to get to know friends from countries as diverse as Japan, Italy, Turkey, and Germany. Hearing about life in all of these different countries from people who are my own age and who don’t look much different from the typical American college student (hehe, perhaps I naively thought, before arriving in Spain, that students from other countries would be easily distinguishable from American students) has been such an interesting and unique experience. untry in a language not her own), I then asked how people could be content to simply sit back and to not defend their freedoms. She seemed to find this question as strange as the first, and shortly thereafter, we returned to studying more modest grammatical concepts. reality in particular, which is this: although every culture is different, and has its own unique traits, we’re all remarkably similar as human beings. And I don’t say that as some watered-down reflection of the polytheistic, pantheistic, tolerance-revering mindset so prevalent in our world. Rather, I think that the image of God in humanity is far clearer and more universal than the more secondary cultural differences among us. Whew! Fall Break is over, but it was a much needed event in my life. While Erskine is a fun and exciting place to be, it also requires a great deal of hard work which can become exhausting over time. Therefore, I jumped at the chance to embark on vacation from school, dorm rooms, and dinner at five o’clock. However, I also had a wonderful event leading my way into the break. Last year I was asked to apply for a scholarship that is given to one student from an independent college or university in South Carolina. Of course, I graciously accepted and thought nothing would come of it. Boy was I wrong! This summer I was given notice that the committee had chosen ME, and Erskine student, to be awarded this special honor as well as a little bit of scholarship money. Along with this honor was a wonderful luncheon, which occurred this past Thursday, presenting me as well as another scholarship winner. My parents were invited, and we even got to eat lunch with the President of Erskine at the ceremony. Now, how many people have even met the president of their college? After giving an impromptu speech behind the other student who had a well-written and academic presentation, I hopped in the car to visit with my parents for the first time in two months! We drove to Indiana to visit my grandparents as well as other family members. I was so thankful that my professors worked this out with me and allowed me to attend both the ceremony as well as this trip with my family one day early. That is just one of those other great things about a small college! (Now don’t think that you don’t have to go to class and such, because you most certainly do. However, professors are human, too, and realize that special honors and family time are important as well). So, now I am back to the routine of school, tests, and dinner at 5p.m. But, if schooling is what I am meant to be doing, I am sure glad to be doing it at Erskine! Once in a while I get the fun experience of bringing a friend from Erskine home with me for a break. This is always enjoyable for the friend because first of all, I am from Charleston so there are many great places to visit, and second because I have an entertaining family! Let’s just say that we all have a quirky sense of humor, and there are few dull moments in the Dumouchel household – especially when we are all together. TJ with the pineapple fountain in Waterfront Park, downtown Charleston. But since our friend TJ had never been to Charleston before, my sister Christine and I decided that we needed to show him what there is to be seen. So, beginning with probably the most famous part of the area, on the first day we headed downtown to the Holy City. We ate our picnic lunch in Waterfront Park, saw dolphins in the harbor, walked down East Bay Street in the famous Rainbow Row section, perused the historical Battery, shopped the newly-renovated market, stopped in a few centuries-old cemeteries, and made sure that we hit all of the necessary landmarks that a day in the city should include. Christine and TJ swinging on the pier at Waterfront Park, downtown Charleston. The next day, after church in the morning and our mid-day dinner, we headed back downtown to the Dock Street Theatre to see the matinee of Dracula. We were thoroughly entertained by the eerie story and the talented actors who very effectively conveyed the horror of the legend. Christine actually went all the way in the cold water! On Monday, our last stop for the break was a trip to the beach. We headed down mid-morning to Isle of Palms, and spent about half of the day. Although the water was too cold for TJ and me, Christine actually got all the way in the water for a few minutes! I spent much of the time working on homework, but reading is just so pleasant on the beach that it did not feel as much like work; it also reminded me of afternoons in the fall on the beach in Spain. Besides these adventures to give TJ a taste of Charleston, we enjoyed delicious home-cooked dinners with my family, talking and joking, movies in the evening, and time to be home together. My older sister’s fiancé also joined us for the weekend, so it was a pretty full house! Although breaks always seem to be too short, no matter how much work I have to do at home or still have to do when I return, the time with family (and, in this case, friends) always helps me feel refreshed and ready to tackle more of the work and busyness of school. Yes it is true I am a DJ. Well maybe not a real DJ, just the DJ for Family Day at Erskine. Last Saturday was Family Day and I was so excited to see my parents! They are on the Parents Advisory Council. This council holds an auction each year to raise funds to give to student organizations that apply for them. This day gives the students a chance to see their parents, meet with teachers, and go watch some sporting events. All of the music groups at Erskine performed to provide more entertainment for the day. It was a good break from schoolwork! Now it is midterm week!! (Ahhhhh) Yes, very scary. However, there is a light at the end of the tunnel with Fall Break approaching! This week has also been filled with planning for Homecoming and Fall Fest. When we return from Fall Break there will many events leading up to the Homecoming soccer game Saturday. On Saturday night EEB is hosting Fall Fest. Since I am the EEB Chair, this has been a work in progress since school began. This year Sequoyah Prep School and Prettier Than Matt are performing. We have teamed up with SGA to provide free shirts for all the students and SCA for pumpkin carving. It is turning out to be a great night! Maybe you can make it?